People with cellphones will receive a message like this one on Wednesday. Wednesday afternoon, at exactly 2:18 p.m. ET, million of Americans received a text headlined "Presidential Alert" on their cellphones. But it wasn't exactly from President Trump. Rather, it was a test of a new nationwide warning system that a president could use in case of an armed attack by another country, a cyberattack or a widespread natural disaster. FEMA estimated some 225 million devices, or about 75 percent of cellphone users in the U.S., would receive the alert. It was to be provided by all the major carriers. And sorry, but you can't opt out. FEMA declared all test messages "were successfully originated and disseminated" to wireless providers. Anecdotally, it seemed to work for many — but not all — cellphone users. FEMA says it will be collecting results of the test message over the next month. During the Cold War, it was pretty common to see and hear tests of the Emergency Broadcast System. Things are a little more sophisticated now, but basically the same minute-long, Emergency Alert System test is conducted every month or so on broadcast, cable, and satellite TV and radio. There was one of those Wednesday afternoon too. But there were also alerts on cellphones nationwide. Many cellphone users receive alerts now — Amber Alerts for missing children, and flash flood or tornado warnings. But Wednesday was the first time for a national, presidential alert issued by FEMA. Cellphone owners were to hear an audible tone and then a text that stated: "Presidential Alert" followed by "THIS IS A TEST of the National Wireless Emergency Alert System. No action is needed." Irwin Redlener, director of the National Center for Disaster Preparedness at Columbia University, says testing the system "is a good idea," and there are a variety of scenarios where it would be good for the president to speak directly to the public. But Redlener has some qualms, especially, he says, when it comes to this president — like worrying it could be used for political purposes "or to create a diversion, if he felt the presidency was under threat." Redlener says "these are not powers many Americans would want to give to Donald Trump." Redlener is not alone. Last week, three people filed suit in New York to block the testing of the system, known as Wireless Emergency Alerts or WEA. The suit states the plaintiffs are Americans "who do not wish to receive text messages of any kind on any topic or subject from President Trump." They say the government is violating their privacy and the sanctity of their homes and that it wants to turn people's cellphones into "government loudspeakers that compel listening." Their request for an injunction however was rejected by a U.S. District Court judge in New York. FEMA says that allegation is baseless. In a background briefing for reporters, a senior FEMA official conceded there is no opting out of the alert but said the system is very well-governed. "You would not have a situation where the president would just wake up one morning," as the official put it, "and attempt to send a personal message." And besides, he has Twitter for that. 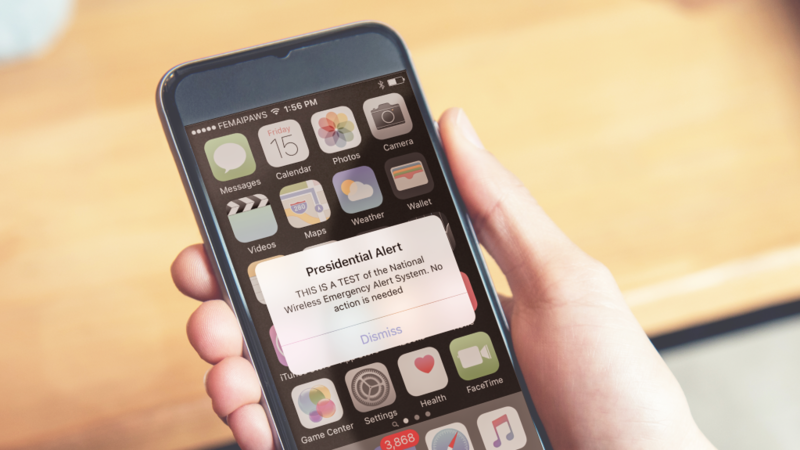 This afternoon at exactly 2:18 Eastern time, you can expect to get a presidential alert on your cellphone. It's not exactly from President Trump. Rather, it's a test of a new nationwide warning system that a president could use in case of an attack by another country or a cyberattack or a widespread natural disaster. Still, some worry President Trump could abuse the system. NPR's Brian Naylor reports. BRIAN NAYLOR, BYLINE: Back in the days of the Cold War, it was pretty common to hear this announcement on TV or radio. You know the one - this station is conducting a test of the Emergency Broadcasting System. Things have gotten a little more sophisticated now. But basically, the same minute-long Emergency Alert System test is conducted every month or so on broadcast, cable and satellite TV and radio. There will be one of those this afternoon, too. But today, you'll also be getting an alert on your cellphone. Now, some of us receive alerts already - Amber Alerts for missing children or flash flood or tornado warnings. But this is the first time that you'll be getting a national presidential alert from FEMA. Irwin Redlener is director of the National Center for Disaster Preparedness at Columbia University. He says testing the system makes sense. IRWIN REDLENER: I think having the testing of this new wireless Emergency Alert System is a good idea. And you can think about a variety of scenarios where it would be good for the president to be able to speak directly to the public. NAYLOR: But this is where Dr. Redlener has some qualms, especially, he says, when it comes to this president. REDLENER: We shudder to think that the president might be using such a system for political purposes or to create a diversion if he felt the presidency was under threat for whatever reason. So I think there are real concerns here. I hate to be so blunt about it, but these are not powers that many Americans would want to give to Donald Trump. NAYLOR: Redlener is not alone. Last week, three people filed suit in New York to block the testing of the system known as Wireless Emergency Alerts, or WEA. The suit states the plaintiffs are Americans who do not wish to receive text messages of any kind on any topic or subject from President Trump. They say the government is violating their privacy and the sanctity of their homes and that it wants to turn people's cellphones into government loudspeakers that compel listening. FEMA says that accusation is baseless. In a background briefing for reporters, a senior FEMA official conceded, while there is no opting out of the alert, the system is very well-governed, and you would not have a situation where the president would just wake up one morning, as the official put it, and attempt to send a personal message. And besides, he has Twitter for that. Brian Naylor, NPR News, Washington. (SOUNDBITE OF KOETT'S "LAST NIGHT ON RIVER") Transcript provided by NPR, Copyright NPR.